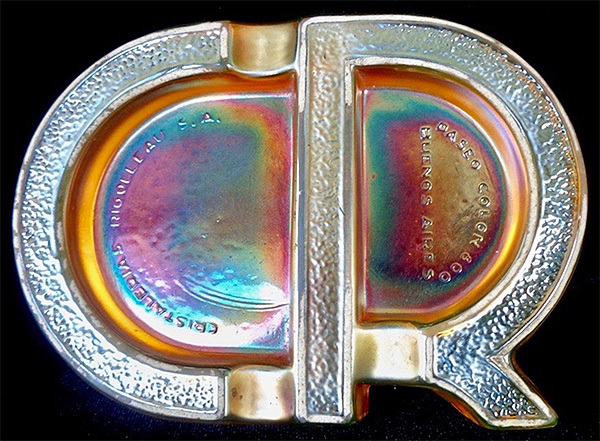 Updated 4/8/2018 Rarely seen, this ashtray is formed of the letters "C" and "R," which stand for the maker, Cristalerias Rigoleau of Argentina. Probably used as a promotion for the glass maker. Vaseline known. See article below. Portions of this article were originally published in the June 2017 issue of ICGA's The Carnival Pump. It is presented here with the permission of the author and the photographer. The following is a short story about a treasure that we never expected to discover while out gallivanting one day in search of Carnival Glass. The adventure started out in a small shop in a little town in northern Illinois. Upon entering we noticed quite a bit of Carnival Glass, not really unusual for Midwestern America. The bulk of it was marigold, also not unusual. As I was looking through one of the cabinets I was pleasantly surprised to find a Cristalerias Rigolleau CR ashtray. 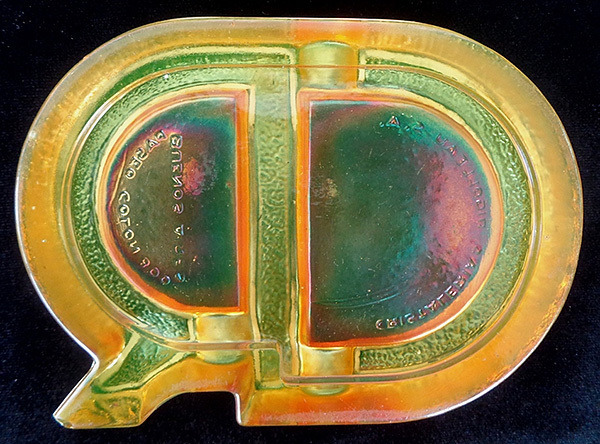 I like collecting Carnival Glass ashtrays and although I already had one of these in amber, I certainly wanted to see this "marigold" one too. We looked it over, noting that it had nice iridescence, but also that the base glass color was not clear glass as would be expected with a marigold piece. Being intrigued and quite pleased to have found a CR ashtray at all, we concluded our business and went homeward bound with happy faces. After the inevitable cleaning, the weird base color needed to be addressed. The color was on the light side, but had a definite greenish tint to it. In addition, it looked like it had some white enameling on the flat edges surrounding the letters. Katie dug out her handy black light (that we had forgotten to take with us that particular day) and turned it on. To our shock, delight and surprise it lit up like a bright neon sign and this was in our sunny kitchen, not even in the dark! I looked at her and said, "It doesn't come in this color, a CR ashtray in vaseline." She looked at me and said, "It does now!" We were both gob smacked. We had found something we weren't ever going to be looking for "because it doesn't exist." It surely is a funny feeling when you find something incredible like this. Hence, this is the reason for looking. One doesn't expect (but always hopes) to someday find an unknown treasure. The truth is that you never know what is waiting for you in that next little shop. 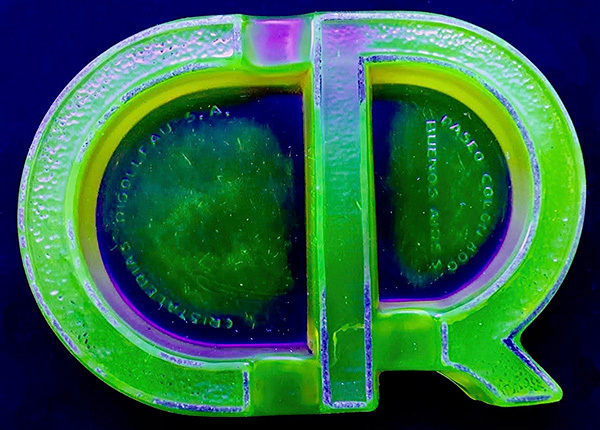 The front of the CR ashtray under black light showing the fluorescence. 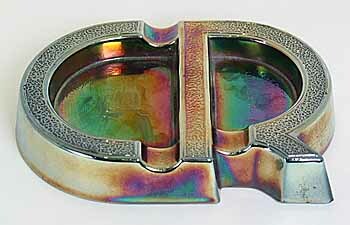 The back of the CR ashtray.